Over the weekend, we found out our Twitter account got hacked. What this means is that someone or an automated application had access to our Twitter account and was sending out direct messages to all our followers. Fortunately that was the only thing that was happening. They could’ve sent out regular Tweets as well. The first indication that someone fishy was going on was that I received a message from a follower asking for clarification on a question. I knew that I didn’t send any messages out for a couple of days. So I immediately checked my Sent Tweets and Direct Messages folders. Sure enough, unauthorized direct messages were sent out to all our followers. This is problematic for food truck owners because they rely so much on Twitter for marketing! It’s an integral part of the mobile food business. Hackers know this. 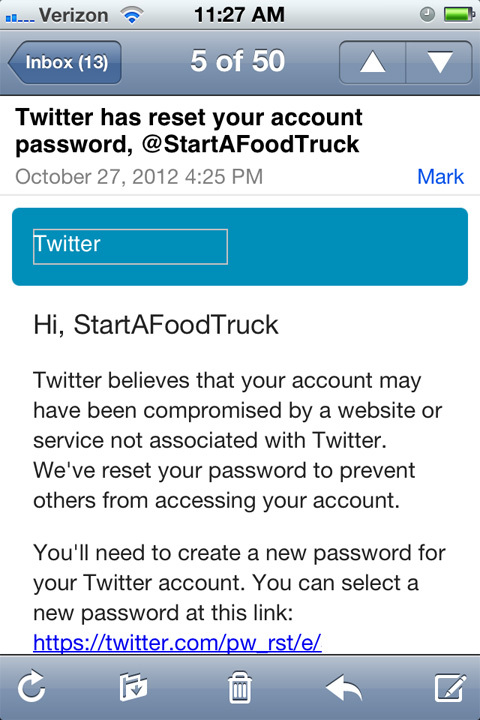 Hackers also know that food truck businesses have lots of followers. So what types of messages were sent out? Notice how the messages are all designed to get the reader to click on the link. And people are usually quick to click on links especially when they’re direct messages. However, you should never click on these links! Sometimes it’s hard to tell if these are legitimate websites or not. And they’re all shortened links so the hacker can track how many people click on the types of messages they are sending out and use that data to more effectively get access to more accounts! What To Do If You Click On A Link? If you happen to click on a link, sometimes the action will not directly have an impact on your Twitter account. Just close the website that pops up and don’t do anything on it! I’m not a hacker so I don’t know what is possible with links. But I do have an idea of when and how my account got hacked. Earlier in the summer, I remember I clicked on a link similar to the ones shown above. When the webpage opened up, it said I needed to enter my Twitter username and password to continue. Not knowing that the page I landed on was a hacker’s site, I entered my name and password. Then bingo, the hackers got my information. The page even looked like an official Twitter page. Of course, after I entered my username and password, nothing happened after that. In other words, I didn’t get the information that was the subject of the original Tweet. Now that the hackers had possession of my login information, it appeared that they waited several months before they started using my account. And that’s when I found out on the weekend that unauthorized Tweets were being sent out. To prevent further unauthorized messages from my account, Twitter automatically reset my password. Then I had to use their link and create a new password. It’s important that you do not use an old password because you never know if the hackers already have that info. Instead, create a fresh, new password this time around. Since I created a new password, I haven’t seen any more unauthorized Tweets sent out. 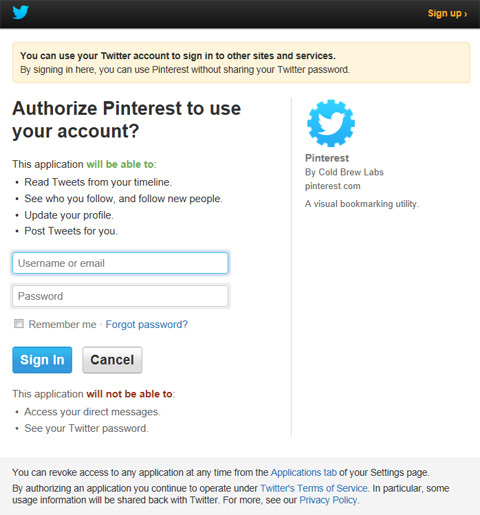 As part of the process, I also checked to see what applications had access to my Twitter account. At the time, the only applications that could communicate with my account were Twitter for iPhone and Hootsuite. Those applications were what I expected. How Do Websites/Applications Get Access To Twitter? Websites and applications get access to your Twitter account mostly because you give them access! 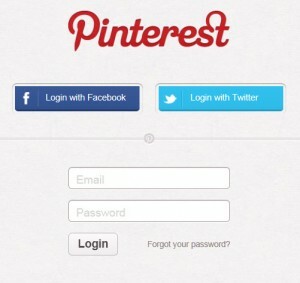 Using the Pinterest website as an example, you can login with your Pinterest username/password or you can use Facebook or Twitter to login. For trusted pages like Pinterest, this is perfectly fine to do. But if you don’t know what applications have access to your Twitter account, you can click on the Applications tab when logged into your Twitter account to see. My suggestion would be to deny access to any application you don’t need! It’s best to keep your account as clean as possible to avoid any unauthorized access! Twitter is a great tool for food truck owners but because it’s computer and internet based, it’s subject to attacks from hackers. You shouldn’t have any problems with hackers if you follow the steps outlined in this post. Your password is the most valauable asset that hackers go for so protect that by changing it annually. It’s a hassle but it can be a good defense against unauthorized access! And finally, do not enter your Twitter username or password on any site that pops up when you click a link! Make sure that https://twitter.com appears at the beginning of the URL to be sure you’re really on the Twitter website! Or you can leave a comment below! We love to hear from our readers! Yes, You can access your twitter account even in locked status by updating your password. To reset your twitter account password, go to the below mentioned address.